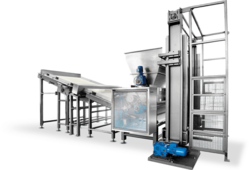 The Dough Feeder system comprising various types of machines is required to feed the Dough Feeder automatically either to the laminator or rotary biscuit moulding machine in pre-sheeted form or in lumps form. Miranda Automation manufactures Dough Feeders. It is provided with auto rejector. 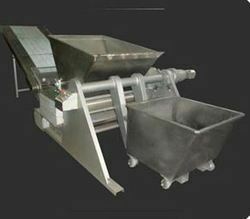 It is used for food and dairy industries. These systems comprising various types of application. These systems comprising various types of Dough Feeding System are required to feed the dough automatically either to the laminator or rotary biscuit moulding machine in pre-sheeted form or in lumps form. the application of this machine is to feed the dough accurately and consistently to the rotary moulder machine. This machine plays a significant role in the over all performance of the entire plant. This unit facilitates metering & uniform conveying of dough being fed, rejection of metal contamination & level control. This machine consists of a heavy structure with steel plates, secured with each other for supporting the rollers, web assembly, the motor and the controls. The construction is modular and the machine stands independently.